Jeanne Manford loved her gay son so much that she founded Parents, Families, and Friends of Lesbians and Gays (PFLAG). She died on this date (Jan. 8, 2013) at age 92. Her son, the late Morty Manford, was beaten during a gay rights protest in April 1972. 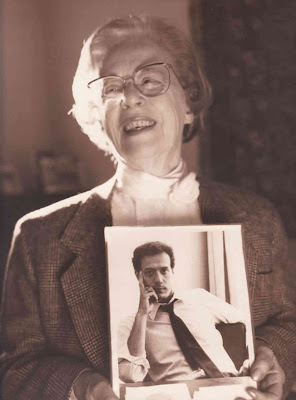 She responded by writing a letter to the New York Post stating, “I have a homosexual son, and I love him.” A couple months later she and her son marched in New York's Christopher Street Liberation Day Parade. These actions and the support she received led to the founding of PFLAG in 1973. PFLAG has grown to 350 chapters with 200,000 members, and Jeanne Manford is an inspiration to many. President Obama talked about her in his 2009 speech to the Human Rights Campaign National Dinner in 2009. Thank you, Jeanne, for your courage and your love! You are counted among the LGBT saints for the huge positive impact that you had on queer people and straight allies everywhere. Thank you for the candle lit to remember Jeanne's love. Thanks again, Kitt. A lovely and meaningful post. You’re welcome! And Mike, thanks again for the news tip that alerted me to Jeanne Manford’s death. Just about a year ago another early PFLAG leader, Adele Starr died. She was also in her 90s. A great generation is passing… Thank God for the foundation that they built.